Clean, friendly, good location, what more can you want. Where to find Petoskey hotels near an airport? Where can I find hotels in Petoskey that are near tourist attractions? 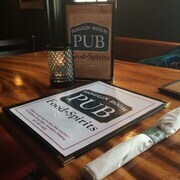 Are you after a nice place to base yourself while you are visiting Petoskey? Expedia currently has 16 places to stay within a 0.1-kilometre (0.06-mile) distance of Petoskey's center. While Petoskey can't boast to having a wide range of accommodations near the city center, Stafford's Perry Hotel is convenient enough to please most visitors. 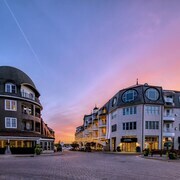 Harbor Springs is an accommodation area that is 7 kilometres (4 miles) from downtown and has 3 Expedia-listed hotels. Some of the better known of the accommodation options in Harbor Springs are the Colonial Inn in Harbor Springs and Best Western of Harbor Springs. Expedia hotels in Charlevoix which is approximately 25 kilometres (15 miles) away include Weathervane Terrace Inn and Suites and Pointes North Inn. 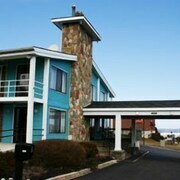 Expedia hotels in Indian River include Hometown Inn and Star Gate Motel. Indian River is 30 kilometres (19 miles) away. The Petoskey area features a solid selection of economical accommodation options that will be sure to please thrifty vacationers and travelers. 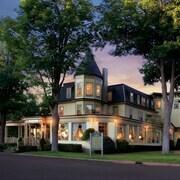 2 kilometres (1 mile) away from Petoskey's downtown is the Terrace Inn and 1911 Restaurant. The Stafford's Crooked River Lodge & Suites is only 16 kilometres (10 miles) away. 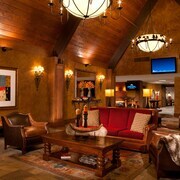 More options in the lower price range of Petoskey hotels are the @ Michigan Inn & Lodge and the Super 8 Hotel - Petoskey. 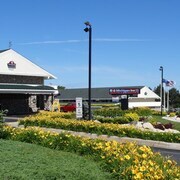 Check out the Boyne Mountain Resort or the Holiday Inn Express & Suites Petoskey. The Boyne Mountain Resort is 25 kilometres (15 miles) away from the center of Petoskey. 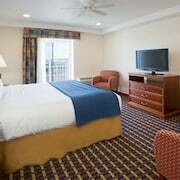 The Holiday Inn Express & Suites Petoskey, is situated 3 kilometres (2 miles) away. 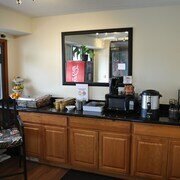 The Hampton Inn & Suites Petoskey and also the Stafford's Perry Hotel are two other recommended accommodation options worth checking out around Petoskey. After you have got to know Petoskey, why not travel a little more of the area? The Northern Lower Peninsula area has many attractions waiting to be explored. View Northern Lower Peninsula's lakes and rolling hills. You should also visit a selection of the area's lighthouses. In this section of United States of America visitors might also try their hand at snowboarding. 85 kilometres (53 miles) to the southwest of Petoskey you'll find Traverse City, where you can spend a few hours exploring Grand Traverse Mall and Old Town Playhouse. If you'd like to spend a few nights in Traverse City, be sure to check out the Great Wolf Lodge Traverse City and Best Western Four Seasons. Alternatively, you could consider staying at Mackinaw City, 50 kilometres (30 miles) to the north of Petoskey, where you'll find the Mackinaw Beach & Bay Inn & Suites and Crown Choice Inn & Suites Lakeview & Waterpark. If you're staying in Mackinaw City, set aside some time to visit the Mackinac Bridge and Old Mackinac Point Lighthouse. Searchfor Expedia's current Petoskey travel listings and learn about the terrific cultural and scenic attractions that this part of the world offers visitors. What are the most popular Petoskey hotels? Are there hotels in other cities near Petoskey? 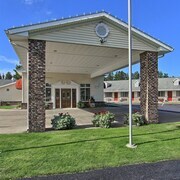 What other types of accommodations are available in Petoskey? Explore Petoskey with Expedia.ca’s Travel Guides to find the best flights, cars, holiday packages and more!